Brother SE400 Good? Bad? Ugly? Thread: Brother SE400 Good? Bad? Ugly? my local dealer has a deal on the Brother SE400, which looks like a really slick machine. I have not used any Brother machines in the past and was wondering how they live up to Janome or Singer. Dont know about that particular machine but Ive had very good luck with Brother machines. I also have a cheap Brother embroidery machine and love it. Simple to use and only 300 dollars but it only does a 4 in size. Hi I have a brothers SE 400 it is a great machine; it is very easy to use; and comes with a user friendly manual. The only thing is when trying to embroider large letters or embroidery the font is 1 1/4 the hoop is 4x4 which is not that large. They have many different stitches. I find it to be a problem when wanting to embroider something larger. you can re-hoop it, but I am that experienced with re-hooping and you must be percise. I purchased mine from Walmart for $308. I enjoy it, that is my only complaint. Don't have the se400 but have only have brothers for 20 yeares and none of them have disappointed me cheap or TOL. I wouldn't think twice about buying another, love all of mine as I have had 4 and one babylock made by brother, all of them very nice, some given away my first was a xl-3010 that I got for christmas when I was 13 and my MIL now uses it to sew, still going strong 20 years later. I'd go for the Brother over a new Singer, at any price. Brother and Janome both have a good reputation. I have that machine plus a Brother Nouvelle 1500. (I call them Baby Brother and Big Brother.) They are both great machines. My husband bought a refurbished SE400 for me for Christmas several years ago. It was a little workhorse, I used it daily for several years until I acquired the Nouvelle. I also have a Pfaff, a Janome, and a Singer, but that Nouvelle (the "Big Brother") is my favorite. I have the Brother SE400. I just bought a Brother Dreamweaver XE. I agree with Crafty about the size of the letters. Also for quilting I felt like I was constantly fighting the quilt trying to get it to fit in the open area. It's only about 6" whereas on the Dreamweaver it's about 12". Pepe! Hope you find the right machine! I read all the responses. Thanks for all the reviews on the brother sewing machines! I had the Brother LB6800-PRW (which is the exact same machine as the SE400 except with the "Project Run Way" logo). I really enjoyed it for sewing, piecing, and especially embroidering (although it would only do a slightly smaller than 4x4 size embroider area). 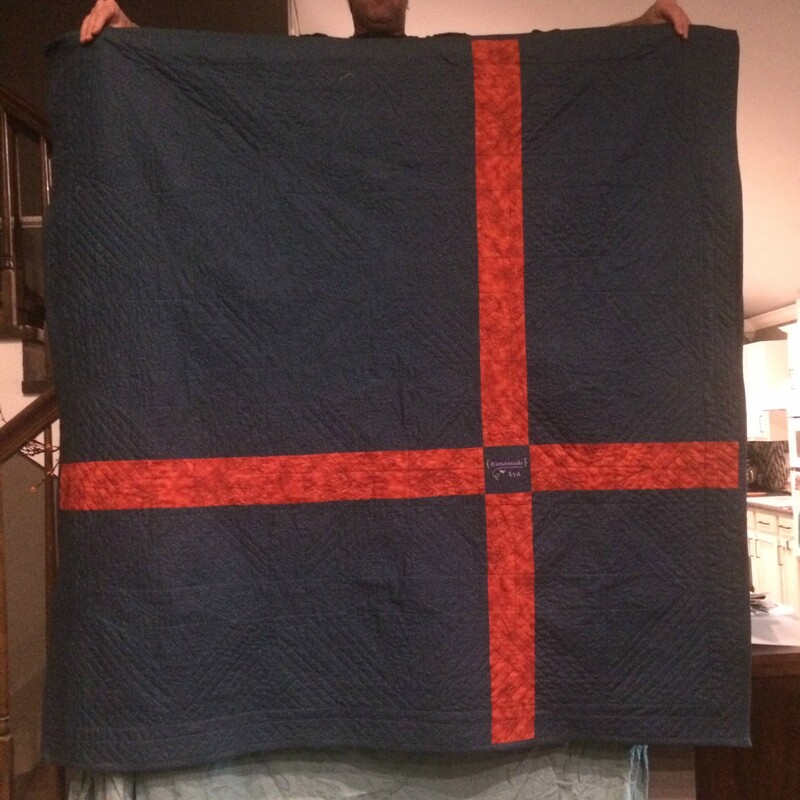 But I returned it/exchanged it within a few weeks because it would not - or rather COULD NOT - quilt (even with a dedicated Brother Walking Foot). It had trouble going through multiple layers with seams and could not maintain an even stitch. PLUS, once I had the walking foot on, I could not use the 1/4" foot and could no longer get an accurate 1/4" seam allowance. 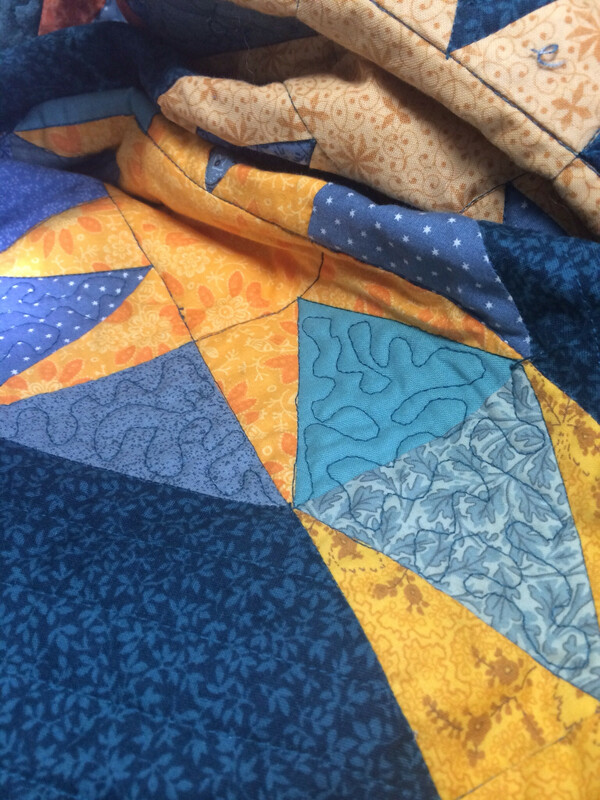 I was taking machine usage lessons (and a Cotton Theory quilting class) at the dealer's store, so I showed the instructor(s) my dilemna - they tried to sew/quilt my block and had the same problem (thought maybe it was just me). FINALLY they brought out my current Pfaff Ambition and asked me to try sewing my quilt square on it - and it worked like a charm - absolutely no problem going through multiple layers/seams - had beautiful, regular stitches. Most of all it had the built-in walking foot (IDT) and I can engage it AND use a 1/4" foot at the same time! The Pfaff also seemed like a more powerful machine. They allowed me to trade in/up to the Pfaff machine and I haven't regretted it at all. True, I had to give up the embroidery function (but I am saving up to get the Brother PE700 embroidery only machine - it has a larger 5x7 embroidery area). Oh, and one function my Pfaff doesn't have that the Brother had is the auto scissors. Miss that the most! And the Brother was much easier to thread - it truely is auto-threading (took me a bit of practice to learn to "auto" thread the Pfaff). But just one look at my quilt blocks I know I made the right decision! So, if all you're going to do is sew, piece, and/or embroider, the Brother SE400 sewing machine is a wonderful machine. If it's your first intro to embroidery, you'll have so much fun (I embroidered EVERYTHING it seems that first week!). The machine also has some beautiful, amazing stitches. But if you plan to do your own quilt sandwiches (especially the Quilt-As-You-Go / Cotton Theory / Reversable Quilt type of quilting that requires sewing through several thick multiple layers with seams) the SE400 and/or LB6800-PRW simply cannot handle it. By the way - if you do end up getting the Brother SE400, I have some "extras" you may be interested in! I have the DreamWorld "SEW STEADY" clear acrylic insert table (junior size) that was custom made for it, the dedicated Brother Ruffler Foot (SA143), and the dedicated Brother Binder Foot (SA109). I'd give you a really good deal for all three! Just let me know! Last edited by icul8rg8r; 06-05-2013 at 06:57 PM. Hi Crafty, thanks for the response and the mini review! On the whole, it looks like a good machine, then! Hi I have a brother SE 400 it is a great machine; it is very easy to use; and comes with a user friendly manual. The only thing is when trying to embroider large letters or embroidery the font is 1 1/4 the hoop is 4x4 which is not that large. They have many different stitches. I find it to be a problem when wanting to embroider something larger. you can re-hoop it, but I am that experienced with re-hooping and you must be percise. I purchased mine from Walmart for $308. I enjoy it, that is my only complaint. Hi Cindy, thanks also for the response and also for the kind offer! Hi! New to the board and I just have a couple of questions regarding the Brother SE400 as well. When is says it has a 4"X4" stitch space, does that mean that is can make a picture/logo up to 4"x4", as long as you have a big enough hoop? Now... My question... Which part of this seems like fantasy? Or have I got it nearly right? I've been sewing and quilting for years and I briefly had a Husqvarna embroidery machine that was loaded with 800 stitches, but was not programmable. A friend who has an embroidery machine in the past, thinks that this would be too small for me, but I just want logos that can fit like on a chest pocket. I don't want whole shirt fronts.. Thanks. I'm new at this whole process and I don't want to drop a bunch of $$ on something as I don't think I'll use it for many things, other than this logo. I have this machine. I love it. For the price point I'd say its unbeatable. Having a speed control, automatic needle threader and automatic thread cutter are fantastic at this price point. It has a bobbin thread sensor to warn you when it's low. It has pretty much all the stitches I've needed in my quilting so far. I have the walking foot for it and I have had no issues whatsoever quilting a quilt sandwich with it. 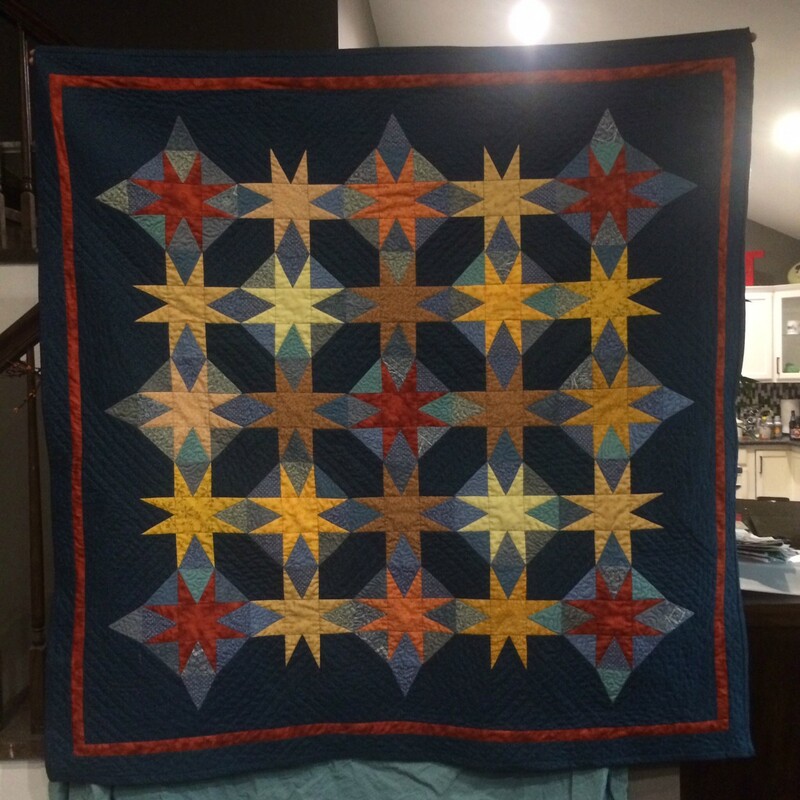 I just recently finished a large lap quilt on it. Mostly walking foot quilted with a little free motion stippling. About the only drawback is throat space. It is small. It does get frustrating the larger the quilt you are working on. However I've been starting to learn free motion and not having to rotate the quilt makes it easier to handle a larger project. I know someone complained about using the walking foot and seam allowances. Well I too had that issue until I discovered the feet are marked. There is a red line for 1/4" from the needle at center. Since I discovered that my bindings are now dead on. It's also marked for judging distance to stop from a seam, again useful for sewing on mitered bindings. Anyway like I said I've had great results both free motion and walking a sandwich. I did find I had to increase my tension quite high to get good results. As far as embroidery. It's pretty good. I don't do much. Mostly little embellishments on gifts and quilt labels. You can't do anything bigger than 4" x 4". You can digitize whatever you want if you have software. It tends to be exorbitantly expensive for digitizing software. Way more than the cost of the SE400. I paid $99 for the Card reader and basic program to transfer designs to my machine. But you can also hook it up to a windows PC to transfer patterns. I do have a ipad app that cost about $5 and is supposed to be able to digitize a picture into pes but so far I can't figure it out. But then I haven't honestly tried to fool with it for longer than 5 mins. When I first got it I was working from a list of requirements from a old pro quilter. Her machine is a baby lock ellisimo. She said look for a machine the cuts the threads automatically. It helps tremendously in piecing. Look for speed control. And a needle threader is nice. This one was by far the most affordable with all those things. And honestly it's a little workhorse. whole project completely sewn on my se400. Made with good LQS fabrics. Batting was a low loft fusible poly. back shows quilting a bit better also I used the embroidery module to make the label. A downloaded pattern plus a font that is in the machine already.